You have to hand it to the political bigots & idiots that make up the Hamas administration. They certainly know how to hand a propaganda victory to the Zionists. Just when the Orthodox in Israel are enforcing a ban on women and men sitting together Hamas wish to join them in their bigotry. I support the Palestinians. Not the politics of the Israeli created Hamas. Palestinians voted for Hamas, nearly 8 years ago now, not because they agreed with Islamic politics but because the alternative – Fateh – was even worse having become little more than a support mechanism for Israel’s occupation. A corrupt group if there ever was one. 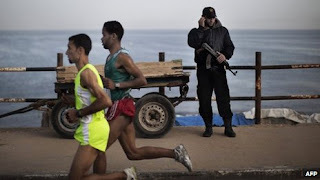 Hamas, whose origin lies in the Gazan and Egyptian Brotherhood, the leader of whom Morsi, is presently trying to become the new Mubarak, with his approval of torture and the murder of demonstrators, is undoubtedly an undemocratic and autocratic group. That is why Israel under Netanyahy in the 1980’s did its best to help create it as a counterweight to secular Palestinian nationalism. Today Hamas is Israel’s best friend. Its charter pays tribute to the Protocols of the Elders of Zionism, not because they have any understanding of this anti-Semitic book, but because they take the Zionists at their word when they say they are opposed to anti-Semitism. Hamas has as much understanding of Zionism as it does of the liberation of humanity. This decision, to bar men and women running together in a marathon is a gift for Israeli hasbarah. Is it possible for the Israeli State and Army to Sink Any Lower than kidnapping an injured child? 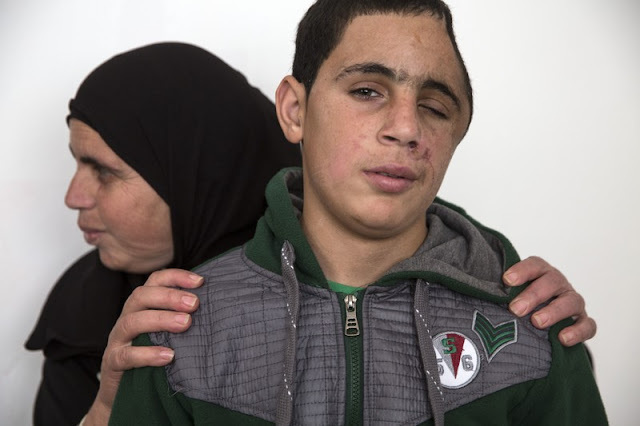 Muhammad Fadel Tamimi, 15, with his mother, at his home in the occupied West Bank village of Nabi Salah on 13 January. A month earlier an Israeli soldier shot at close range with a rubber-coated metal bullet causing serious head injuries. 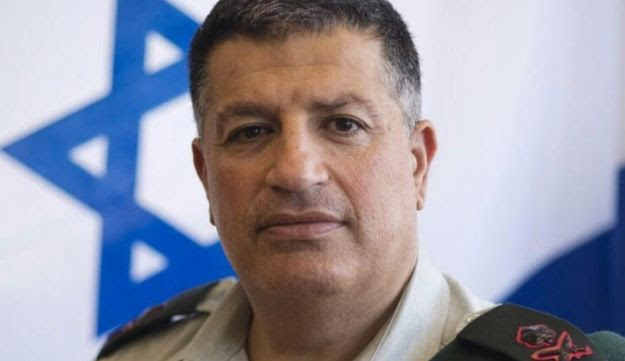 It is a story which is almost unbelievable, not least because of the stupidity of the Israeli army and the Head of the Occupation, General Yoav Mordechai. Mohammed Tamimi was shot at point-blank range with a rubber bullet at the end of the December. The would be murderers were the Israeli army. 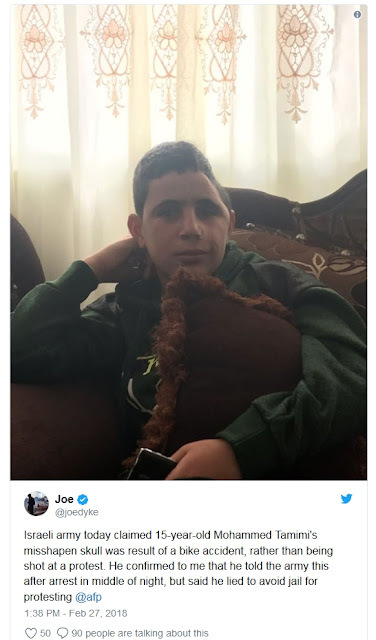 It was this incident which provoked his cousin, Ahed Tamimi to slap the Israeli soldiers who invaded the grounds of her house. One of these soldiers was believed to be the man who nearly killed her cousin. Fast forward to Monday of this week and a posse of Israeli soldiers raids Nabi Saleh and arrest 10 people, of whom 6 are children including Mohammad Tamimi. Despite having been severely injured and awaiting surgery, these animals roused Mohammad from his bed and kidnapped him. Then in accordance with their normal racist routines, Mohammad was interrogated without, of course a lawyer or parent present. 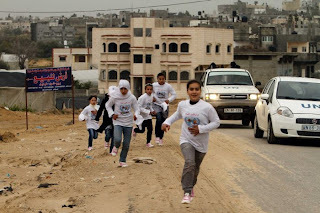 A practice which is never extended to Jewish children but which the media in this country does not, of course report. What happened next is surreal. Frightened, fearful and no doubt anxious as to when he was going home and anxious about the fact that he was still very ill, Mohammad was ‘persuaded’ to agree to the pathetic lie that was put to him that he wasn’t shot but fell off his bike! The fact that a bullet was taken from his skull and that there are X-ray photographs to prove it, was ignored. This pathetic Zio story has been debunked by Sarit Michaeli of Israel’s human rights group Btselem who rightly called it Orwellian. The idea that Mohammad fell off his bike is easily disprovable with medical evidence. When he was released Mohammad confirmed that the only reason he agreed with the Zionist version was out of fear. However the reason why Israel’s soldiers engaged in this macabre game was to ‘prove’ to its far-Right constituency that all the reasons given for his cousin Ahed’s slapping of a soldier were a lie. And of course Israel’s media, bar Ha’aretz, played along with this. The fact that Israel refuses to record its interrogations of children or indeed adult prisoners gives the lie to the allegations made by Israeli army commander, General Mordechai. It is also clear that the campaign to free Ahed Tamimi has severely embarrassed the Zionist regime in Tel Aviv. Despite the attempts to dismiss her as a good actor, as a girl who is older than her ‘official’ age or not part of a proper family, the fact is that the campaign has achieved massive support. The reaction of the Israeli army is an example of the observation that military might and stupidity exist in inverse ratio to each other. However you will be pleased to hear that in the case of a 17 year old Jewish settler living in Geulat Zion that matters were entirely different. For being locked up for one night and being placed in handcuffs he was awarded 6,500 shekels (nearly £2,000). Ahed Tamimi and indeed most Palestinian children are handcuffed and indeed shackled. When Ahed was brought before the military judge and asked how she struck the soldier she replied that if they took handcuffs of she would show them! It is nice to know that in the Jewish state that Jewish children are given such consideration and preference. Almost heart warming. One of the classic warning signs of abuse is when a child shows a pattern of injuries, but the abuser forces the victim to go along with cover stories claiming the victim simply had a series of unfortunate accidents. Israel, as a serial and systematic abuser, is once again demonstrating how shameless it is in its attempts to cover up its horrifying mistreatment of Palestinian children and to blame child victims for its own crimes. 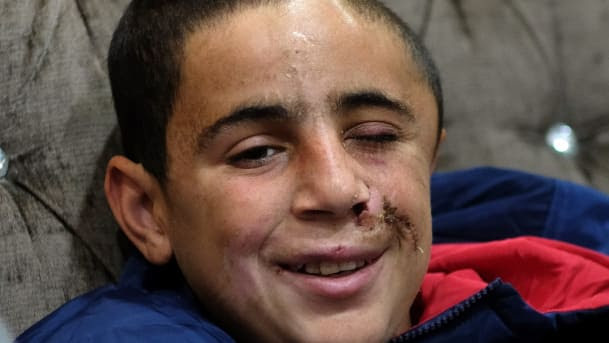 On 15 December, in the West Bank village of Nabi Saleh, an Israeli occupation soldier shot Muhammad Fadel Tamimi with a rubber-coated metal bullet at close range, causing devastating head injuries. Photos of the 15-year-old have circulated around the world showing the effect of having one-third of his skull removed during life-saving surgery. While he awaits restorative surgery he remains very vulnerable, and faces a long recovery. His case has been all the more embarrassing to Israel because he is the cousin of Ahed Tamimi, the 17-year-old who has been in prison for two months and is being subjected to a military trial in an Israeli kangaroo court for slapping and shoving two heavily armed occupation soldiers shortly after Muhammad was shot. Both are members of the Tamimi family, against which Israeli leaders have vowed collective punishment and revenge because of their prominent role in the nonviolent resistance campaign to Israel’s theft of Nabi Saleh’s land for colonial settlements. In the predawn hours of Monday, Israeli occupation forces raided Nabi Saleh and arrested 10 people, including six children. One of them was Muhammad Fadel Tamimi. They took him away for interrogation and released him hours later leaving observers once again stunned at Israel’s callousness and cruelty. 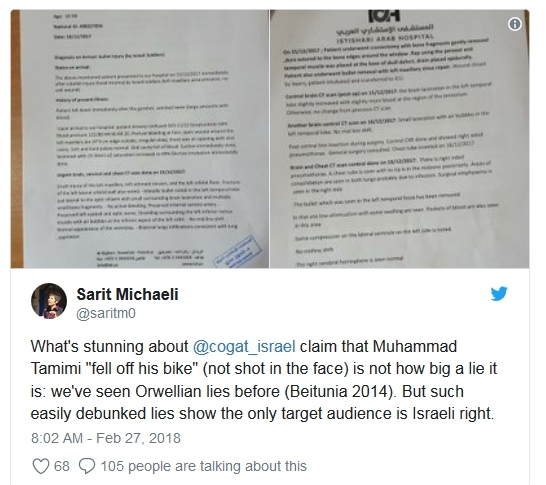 Yet all became clear Monday night, when Yoav Mordechai, the general who runs COGAT, the bureaucratic arm of Israel’s military occupation, posted on Facebook what he clearly thought would be the revelation to absolve Israel of its crimes against Muhammad. And it fit the classic pattern of the serial abuser. According to Mordechai, the boy had not been shot in the head after all, but had merely fallen off his bike. His post was accompanied with a graphic with the words “fake news” emblazoned across it in Arabic. 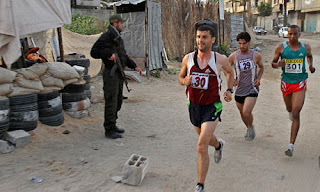 Mordechai, it should be noted, works closely with the Palestinian Authority – collaboration between occupier and occupied that is actively promoted by UN officials. Human rights defenders and journalists were quick to debunk Mordechai’s outlandish story. Sarit Michaeli of the Israeli human rights group B’Tselem described Mordechai’s claim that the boy merely “fell off his bike” as Orwellian. Along with this denunciation, Michaeli tweeted copies of a medical report from the hospital that had performed the emergency “bullet removal” surgery from Muhammad Tamimi’s head. “Tamimi, witnesses said, was standing on a ladder behind a wall and was hit in the head the moment he raised it above the ledge,” the newspaper added. It also published photos of the bullet removed in the surgery and of a CT scan showing it lodged inside Muhammad’s head. 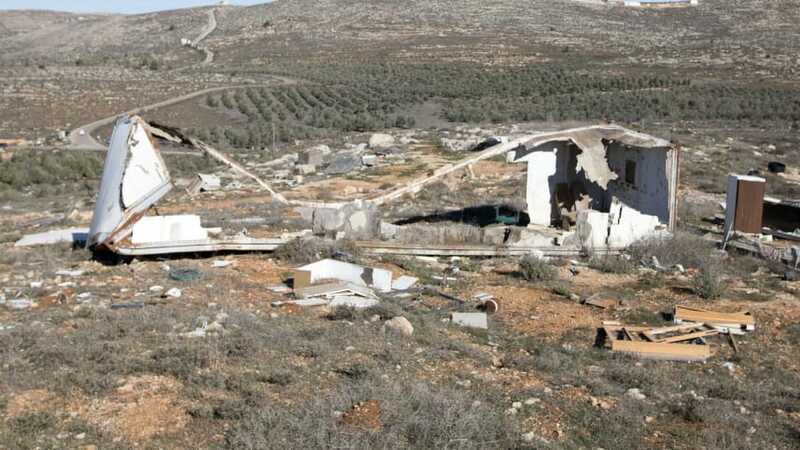 “According to the eyewitness, Israeli forces appeared to have exited the area around 4 pm when an Israeli soldier shot Muhammad in the face with a rubber-coated metal bullet at close range,” the group stated. “He [Muhammad] was laying on the ground. His face and clothes were covered in blood,” the eyewitness said. Lasky confirmed to The Electronic Intifada that Muhammad was interrogated without a lawyer or a parent present, one of many abusive practices Israel uses against detained Palestinian children to coerce confessions. All this evidence will not convince the Israeli army, nor Israel’s most fanatical supporters; the goal of sending soldiers to arrest a badly injured child in the middle of the night and then having a general post his “confession” on Facebook is not to seek the truth but to sow doubt. And this is where the pattern comes in: Israel’s obfuscation, lies and denials are legion, but it suffices to point to just a few. B’Tselem’s Michaeli recalled another instance of Israel’s Orwellian lies: Beitunia, 2014. This is a reference to the 2014 Nakba Day killings of 17-year-old Nadim Nuwara and 16-year-old Muhammad Abu al-Thahir. Both were shot dead in cold blood the same day and in circumstances where they posed no conceivable threat to anyone – killings that were caught on video. After the shootings, Israel’s spin doctors were out spreading their Orwellian lies. 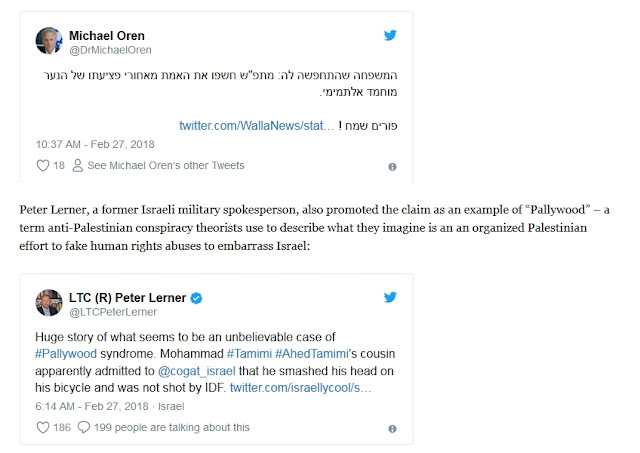 Michael Oren, now a deputy minister in the Israeli government, went on CNN to claim that the two boys shot dead on 15 May 2014 might not even be dead. In order to cast doubt, he cited the videotaped shooting of 12-year-old Muhammad al-Dura in Gaza in 2000 at the outset of the second intifada, which generated worldwide outrage. Israel also first denied live ammunition had been used in the Nakba Day killings but when the evidence could not be buried it finally indicted one of its occupation soldiers, Ben Dery, with manslaughter for killing Nuwara. No one has been charged in the killing of Abu al-Thahir. B’Tselem’s Michaeli made an astute observation that Mordechai’s fabrications are intended solely for the consumption of the Israeli right. That’s an indication that Israel understands that it is badly losing support among international audiences who care about human rights. And on the world stage, Israel is ever more reliant on alliances with a global far-right that is eager to lap up such lies, just as it shares Israel’s rampant Islamophobia, racism and xenophobia. The message for anyone who cares about human rights is very clear: an Israel this unhinged and brazen doesn’t care about what human rights groups say in their meticulous reports, and is not bothered by the timid bleatings of European Union and UN officials. Israel only cares what people do, so the answer to this outrage must be more efforts to isolate this regime and make it pay a price through boycotts, divestment and sanctions. The Judea and Samaria Police were ordered to pay 6,500 shekels ($1,869) to a 17-year-old settler who was kept in a lockup overnight and brought to court in handcuffs unnecessarily. The Jerusalem Magistrate’s Court criticized the police for letting the youth sleep in the police lock-up and noted that bringing the youth to court in handcuffs was unlawful. The teenager was arrested in June 2016 at the Geulat Zion outpost, considered to be one of the most extreme in the West Bank, on grounds he had violated a military order closing off the area. Geulat Zion is not a permanent community, as the authorities periodically remove the small groups of settlers who set up camp on the hill. The outpost is now located near the site where the new settlement of Amihai is being built for the families evacuated from Amona last year. Police planned to release the youth with restrictions the day after his arrest, and left him to sleep in the jail cell. Police also planned to ask the court to keep him away from Geulat Zion for 180 days. The following day, he was brought to the Jerusalem Magistrate’s Court in handcuffs. The court explained, “Based on case law, it is not proper to delay the release of a detainee that the police believe should be released with conditions, simply because the conditions at issue are the type that must be determined by a judge. In such cases, imposing the restrictions that are within the authority of a police officer is sufficient and after the release, if needed, there can be a request to impose more stringent conditions that will be discussed before a judge.” With regard to the police intention to ask that the youth stay away from the area for half a year, the court said this wasn’t sufficient grounds for leaving him in the cell. The judge also expressed annoyance that the officer who made the decision to keep the youth overnight hadn’t even testified in court. “There was reason to expect him to appear to give testimony, to explain his considerations and be questioned about them,” the judge wrote. The court was also critical of the decision to bring the youth to court in handcuffs. “People who constitute part of the general public circulate in the halls of the courthouse and are liable to see the prisoner while he is handcuffed,” Yehezkel wrote. “The courthouse is defined as a public place in various pieces of legislation. I believe that the court should also be seen as a public place for the purposes of the Youth Law and the Detention Law, and police procedures cannot contradict this. “Moreover, the police’s own regulations state that in general one does not restrain minors while in detention unless they are acting wildly,” he added. As a result, the judge ordered police to pay the youth 6,500 shekels. 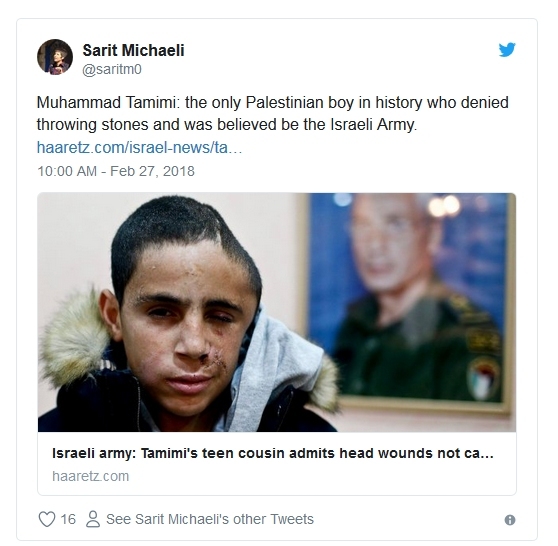 According to him, the liar is not only 15-year-old Mohammed Tamimi. The liars are also his parents, members of his extended family in the village of Nabi Saleh, and friends – including Israeli leftist activist Jonathan Pollak. The latter were with Tamimi when he climbed a ladder on December 15 to see what the soldiers, ensconced in an empty house in his village, were up to. The teen was shot in the head and fell to the ground in a puddle of his own blood. In his Facebook post on Tuesday, Mordechai claims, in effect, that the Palestinians are stupid because so many of them collaborated in creating a lie that is so very easy to expose. If indeed there was a lie. Still in the dark, half asleep and shaken, surrounded by rifles pointing at him, with air reeking of tear gas and the disgusting smell of the skunk-water sprayed by the troops – Mohammed Tamimi was taken in for interrogation. It is easy to guess what went through the mind of the wounded boy, who is slated to undergo yet another operation to reconstruct his skull in the coming weeks. He must have been thinking: Perhaps I'll be held under arrest for many weeks. Perhaps my medical condition will get worse. Perhaps I won't even be released before going into surgery. The security forces carry out hundreds of arrests and interrogations every week in Jerusalem and the West Bank. No one disputes the fact that one of their aims is to expose those who plan or carry out armed attacks. A second aim is to gather information, even of the most innocent sort, about as many people as possible and about social and political activities. Very banal, sometimes even embarrassing, information is extracted – even years later and under unexpected circumstances: when a person travels abroad, or when someone applies for an entry permit into Israel or for a residency permit for non-Palestinian spouse. A third aim (though not necessarily the third most important) is to quash popular activity against the occupation, of which the village of Nabi Saleh has become a symbol. Palestinians are forbidden to demonstrate their resistance to the occupation, in any manner. One of the ways of deterring individuals who may be potential participants in popular struggles is to wreak serious harm on people who are already taking part in them – by means ranging from injuring to killing; to detention under conditions harsher than those encountered by graft suspect Nir Hefetz; sleep deprivation; painful handcuffing; humiliating interrogations; ridiculous accusations like those based on "evidence" like empty tear-gas cannisters or visits to book exhibitions; administrative detentions (arrest without charges being filed); arrest until the conclusion of proceedings; and exorbitant fines. Mass arrests, interrogations and collecting of information – these are an integral part of the control Israel wields over the Palestinians. Many of the arrests are another means whereby Israel attempts, systematically, to undermine and unravel the Palestinian social fabric in order to weaken its ability to withstand and defy the occupation. When the detainees are minors, their jailers have a greater ability – with the help of a few slaps, painful positions during questioning and psychological pressure – to extract false incriminations and exaggerated, boastful descriptions of events from them. It is easy to manipulate and break them. 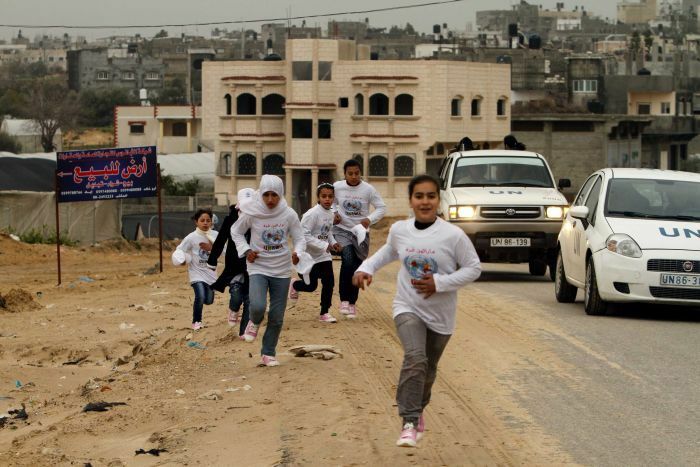 Among themselves the Palestinians are debating participation of minors in protest activities against the occupation. The ethos of the struggle is dear to them, and the loathing of the occupation runs too deep for this debate to be conducted in public, but the high price that is being paid by minors and their families is clear to everyone. It is too early to say if a post like Yoav Mordechai’s will encourage the debate and whether it will be taken into the public domain or strengthen the position of those who say that Israel stops at nothing in order to oppress and therefore youngsters should not be denied their right to revolt.